In his tenure as NFL commissioner, Roger Goodell frequently talked out of both sides of his mouth. "I'm for player safety," he says, while at the same time asserting, "The NFL desperately needs an 18 game regular season." He has doled out suspensions like the most popular house in the neighborhood doles out Snickers bars on Halloween. At the same time, he awkwardly hugs every draft pick as they walk across the stage on draft day. Remember that scene in Chinatown? "My sister! My mother! My sister! My mother!" Yeah, you know what I'm talking about. 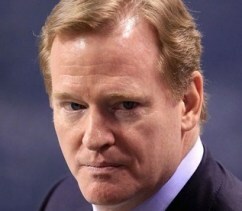 Goodell's inconsistency (some might go so far as to say hypocricy) has been a burr under my proverbial saddle for years. All of which was exacerbated by the fact that the NFLPA, foolishly, did not insist on some reasonable checks on the Commish's power in negotiations for last year's CBA. And then came BountyGate. (A moment to say, the whole 'gate' thing bugs. Can we figure out a new thing? Thanks.) So the whole bounty scandal. Judge Dread swooped in and threw down suspensions right and left, suspending four players for the entire season. In a sport where youth is king and every week matters, this is huge. Vilma tweeted that victory was his. And it was. But it's a bigger victory than one player, or four. It's a slap back on a classic over-reach by a guy who has been able to dictate policy willy-nilly. Do I think it's okay for teams (coaches and players) to try to injure or maim opposing players? Of course not. Let's just get that out there. Do I think the NFL can do more to protect players? Of course I do. But I am always a fan of anything that checks unchecked power.